Greetings, (in particular, Brighton-based) Ghostwatchers! This October, Miniclick and the illustrious Duke of York's Picturehouse shall be hosting a very special screening of Ghostwatch, complete with a live Q&A session featuring writer-producer-directors, Stephen Volk, Lesley Manning, and Rich Lawden. It goes without saying, Ghostwatch screenings with Q&As tend to be on the rare side, so try not to delay if you're thinking of booking! There's even a twenty-foot high pair of can-can dancer's legs on the roof, so it should be quite easy to find, even if you've never visited before. First opened on 22nd September 1910, the building itself is now Grade II listed, and to celebrate its 105th(!) birthday this September, the cinema will be installing a "State-of-the-art sound system and audio-visual projection to invest in an even better film-going experience in the future." Surely, this will provide the best possible viewing experience to track down the remaining, elusive Pipes sightings? There's only one way to find out. See you there! So, to recap: Wednesday 14th October, 6:30pm. 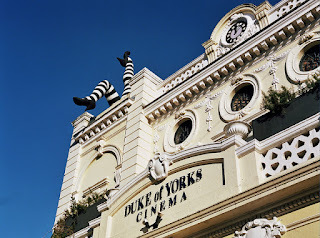 The Duke of York’s Picturehouse, Brighton. Tickets include the Q&A and are priced from £9.00, which can be found by clicking here. During Monday's edition of the BBC One nostalgia fest, The TV That Made Me, this week's guest, Pam Ayres shared her own personal appreciation of classic BBC Horror, Quatermass. Around that time, you might also have caught a small reference by host Brian Conley to our very own Ghostwatch being his "Favourite chiller!" For a limited time, you can check out the episode in full on BBC iPlayer by clicking here. For the beginning of Pam's 'TV Fear' segment, which also features the public information film/nightmare generator, Protect and Survive, head to around the 13:40 mark. Brian's spooky showcase follows soon after, at around 20 mins in. For the trivia-hungry among us, this marks the first time since October 2012 that Ghostwatch was last cap-doffed on TV (during CBBC's Twelve Again.) It's quite extraordinary that despite the fabled, full repeat screening still not showing any signs of happening anytime soon, the most recent partial broadcasts have all aired during daytime slots. Well, almost. But we're not going to mention the other show. Oh, no. Not since they knocked Tiffani Banister, too. 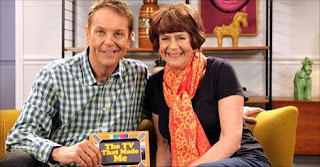 We asked @RealBrianConley if he was indeed a fellow Ghostwatcher, on Twitter. Our message was favourited, just a short while later. That made my day, that did. I mean, honestly, not even Septic Peg could have seen this one coming.